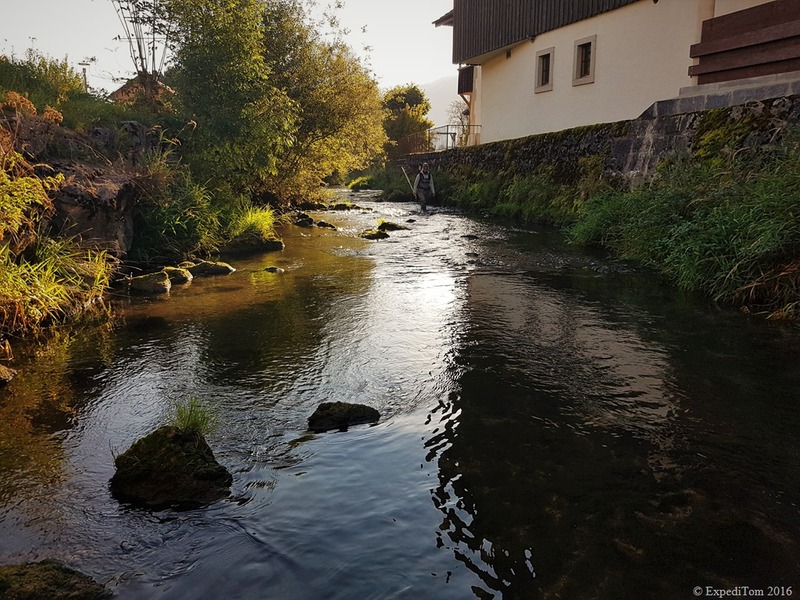 André and I departed early on our end of trout season trip and drove to the head waters of a river in the Jura mountains. André had already been there a few times and was very enthusiastic about this stretch of water. And so was I. We both started fishing with dry flies. 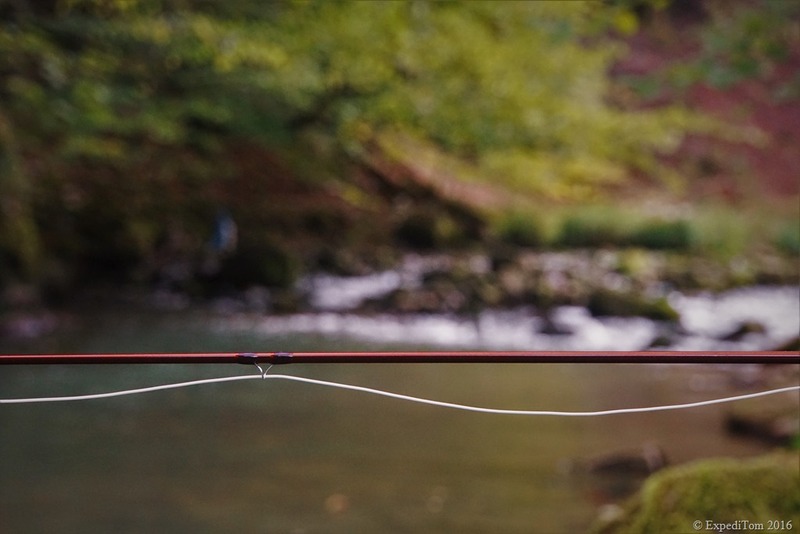 Whereas André used a CDC pattern on his Scott F2 #3 6.6′ fly rod, I tied on the classic Adams in size 16 and casted with my Arctic Silver Innovation #5 9′ fly rod. I have to admit, that my choice of fly rod is pretty oversized for this stream. However, it is the lightest one I own. 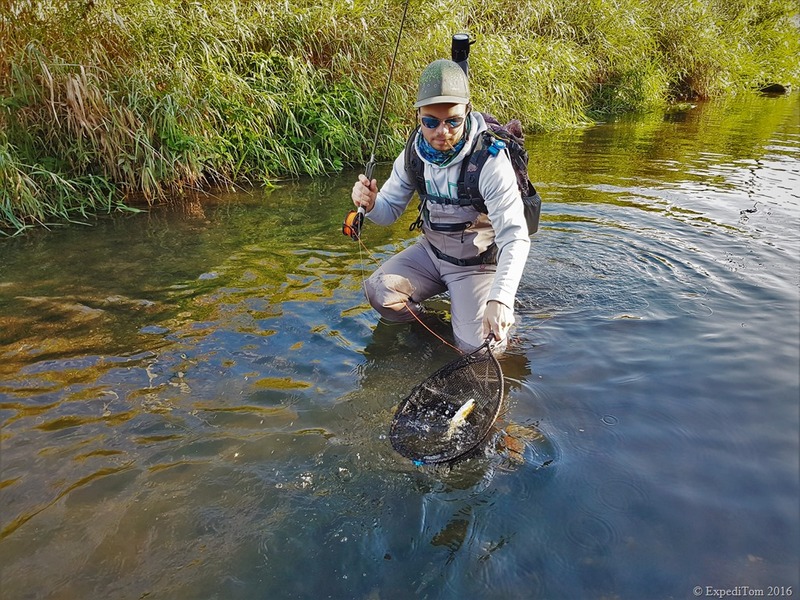 Although the water level was very low and André was a bit concerned about that, it was not long until the first fish found its way to (my) net. A small trout could not resist the dead drifting Adams and both of us were happy about the very first catch of the day. Shortly after André hooked and landed another gorgeous trout. […] underwater insect represent 80% of the food source of fish. We continued upstream until we reached a riffle alongside of an artificial built wall to protect the bank from erosion. In comparison to the average depth of the small creek, this pool was very deep. On the one hand we could read the water and on the other hand André knew this from previous trips. We tried both dries with no success. 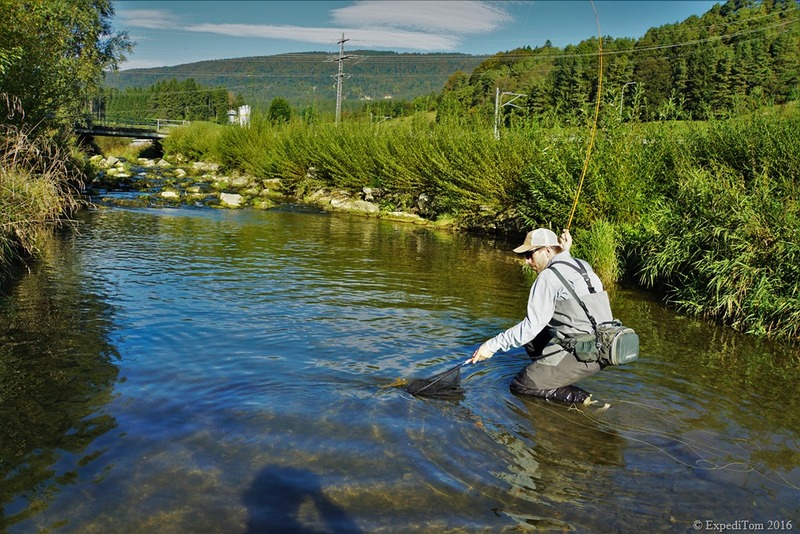 André, the dry fly dogmatic for this day only, as it was the last of the season, refused to change his rig. 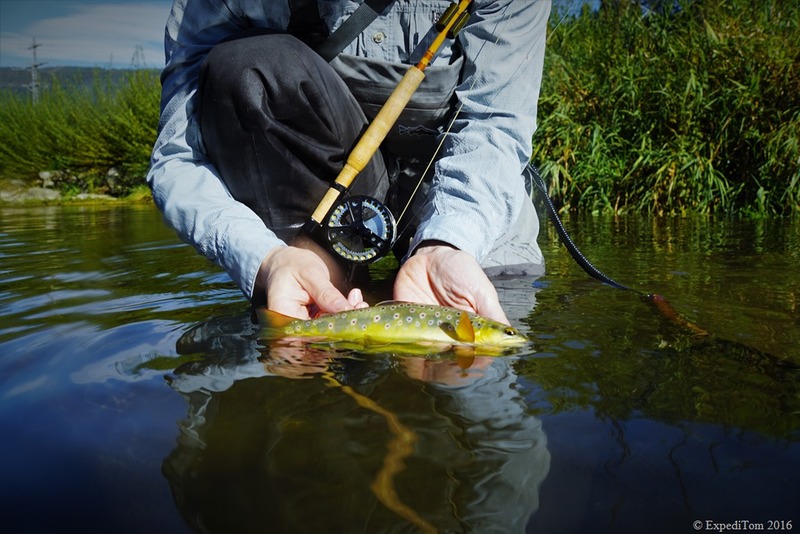 Even though, I agree with him that dry fly fishing is the most beautiful fishery, as I stated in the post about another adventure, I often use nymphs. Especially, because according to other fishermen and my experience, underwater insect represent 80% of the food source of fish. 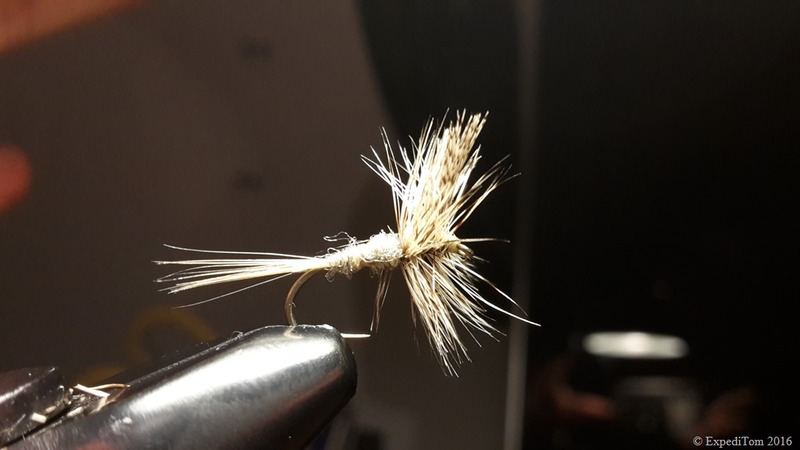 Thus, I decided to change for a small gold bead nymph, called Copper Tom Nymph. With success. We landed several fish in this riffle. We reached our last pool of the morning session during our end of season trip. Actually, there were several pools. A cascade of white water dropped into a basin of about width of 6 metres. In the main current several trout rose now and then. However, on the right side there was as well a distinctive bubble line where other fish were rising repeatedly. 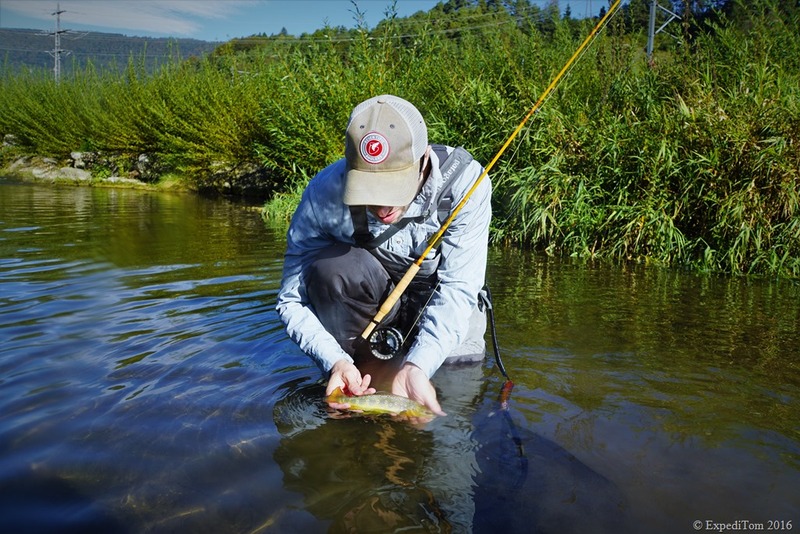 André began casting tight loops into the main current and after several attempts the trout ate the dry. It was a beautiful fish with gorgeous red spots. In particular the edges of the fin were spectacular: they were white. 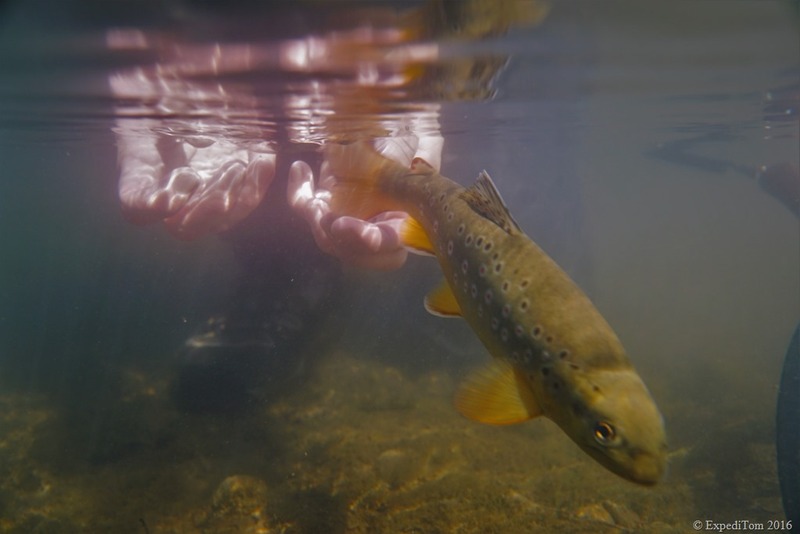 I had never recognised such fins with white edges on a brown trout. 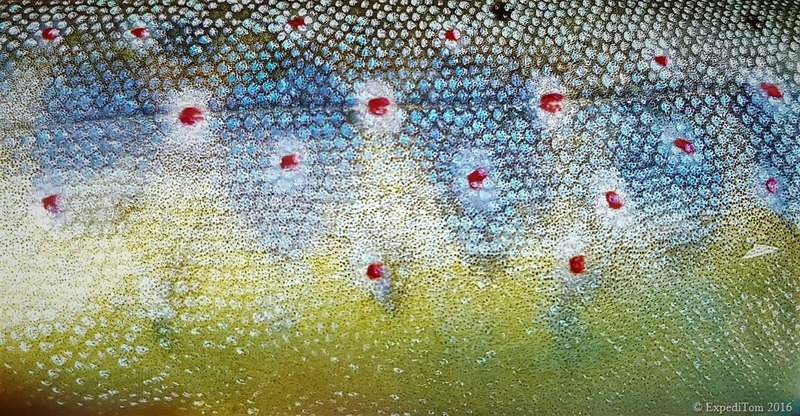 Usually, you only see brook trout with those white edged fins. Therefore, I was even more amazed by this great river. However, André and I were not yet happy with the result of this large pool. There must be more fish in there. We downsized our dry flies to 20 and now we caught more trout. We assumed, that the tout might have been eating subsurface and smaller flies swam further in the surface film of the water. However, we did not meet big momma. Then we headed back to the car to go for lunch into a nearby town. While walking back, we came across a bridge, where we were able to watch about 20 small trout eagerly rising to minute flies in the surface film. 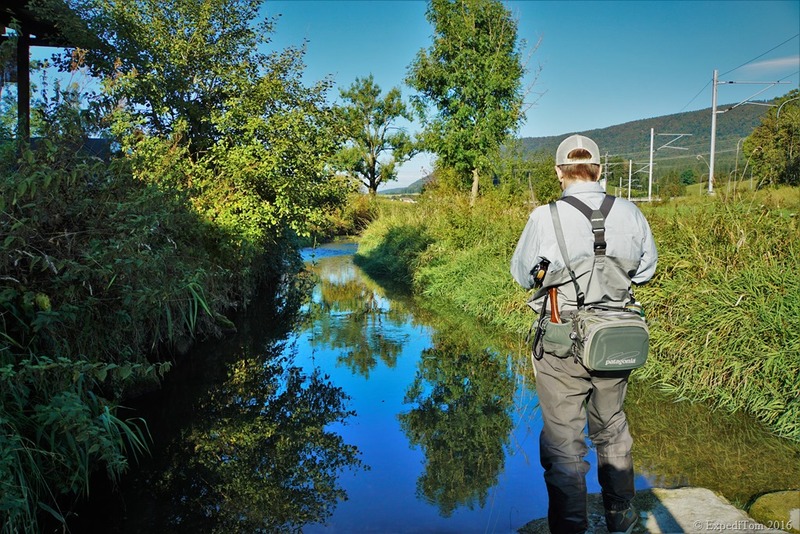 Rising trout in a Swiss river from ExpediTom on Vimeo. 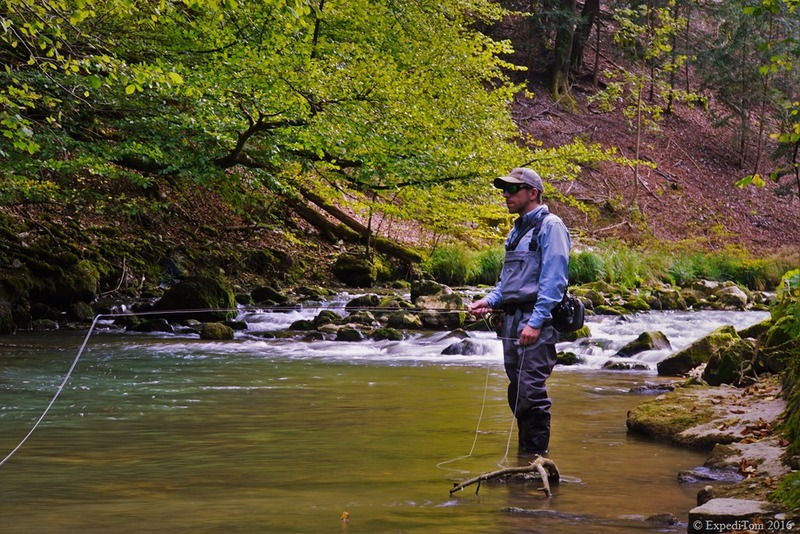 After having had lunch, André and I continued our end of trout season trip further downstream in a gorge. 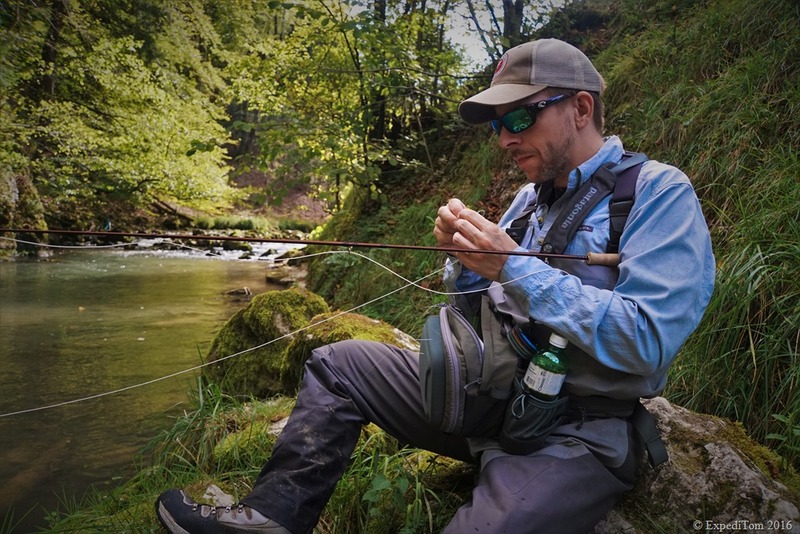 There, André changed to his Sage TXL-F #4 6.1′ and did a great job with a dry fly dropper rig. He caught multiple trout. In contrast to this, I struggled. I did not manage to cope with the fast current. My fly often dragged and so I did not hook a lot trout. Additionally, the ones I hooked got away. However, the scenery was (disregarding of the street) amazing. 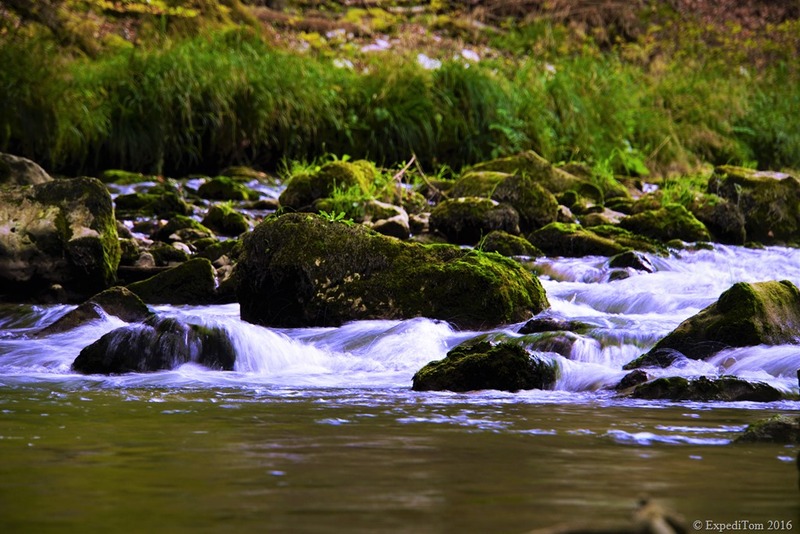 Do you hear the ripple of the river? I do. Soon we realised that all trout we hooked were pretty small. Hiking and fishing further upstream, we saw why. Another fisherman seemed to have just fished the very same stretch of water. Bugger. Still, we went on with fishing. The last stretch was rather a still water than a river due to a hydro station. 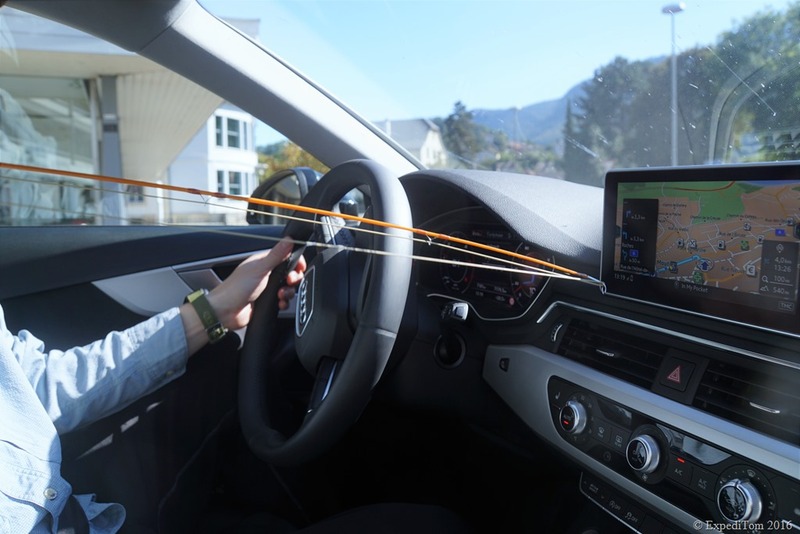 A lot of space allowed casting long distances. 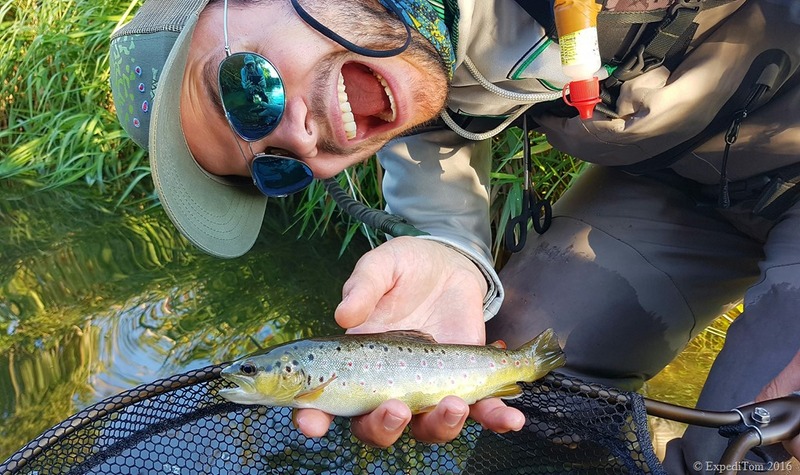 There, I was very surprised when I hooked a fish ona dry fly who was about 20 metres away from me. I even landed it. This was the final fish of our end of the trout season trip and we both returned tired but happy back to the car and home. André and I had another splendid fly fishing trip. We caught trout on dries and some fish on nymphs. Although another angler fished the same spot in the afternoon, we were still successful. 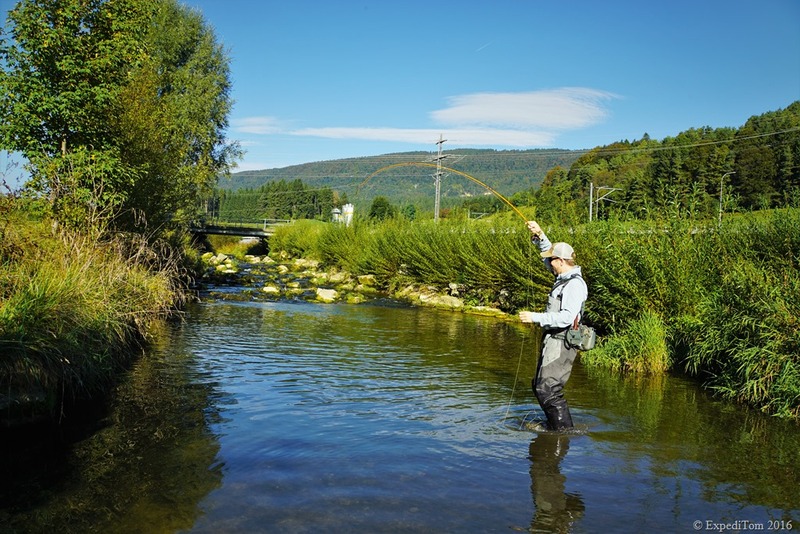 This can happen in such a small country like Switzerland on the last day of the trout season. However, as you could see, it was not a disaster. We still caught fish and had a great time in the water. 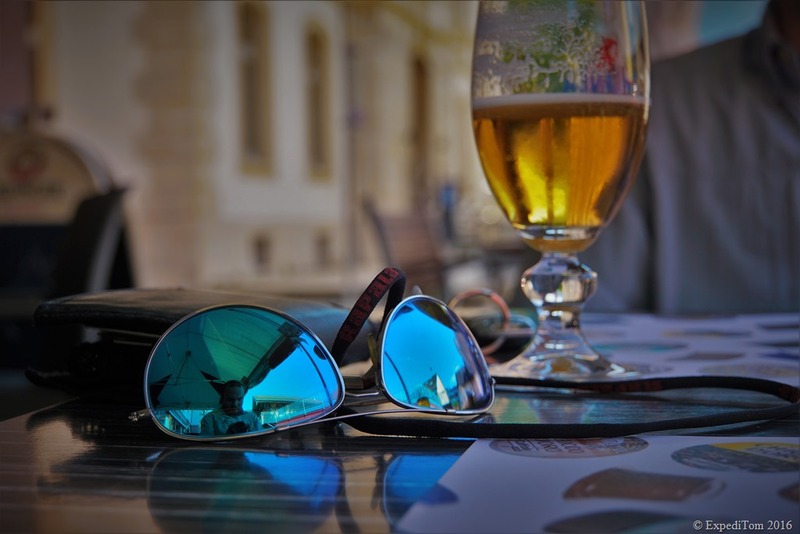 This post showed that it is useful to carry some really small flies with you. This might save a fishing day, when the fish are very picky and only eat selective. In our case, we knew there must be more fish according to the many rises we saw. Thus, we downsized the fly and caught a lot more. Thanks André for this great water you showed to me, it was a pleasure to fish with you! What is your experience with smaller flies and selective feeding fish? 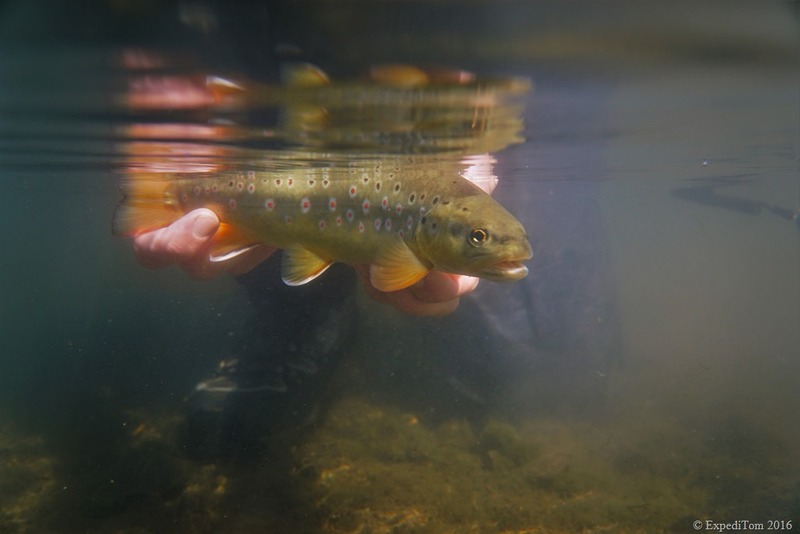 Have you ever seen brown trout with such white fins? 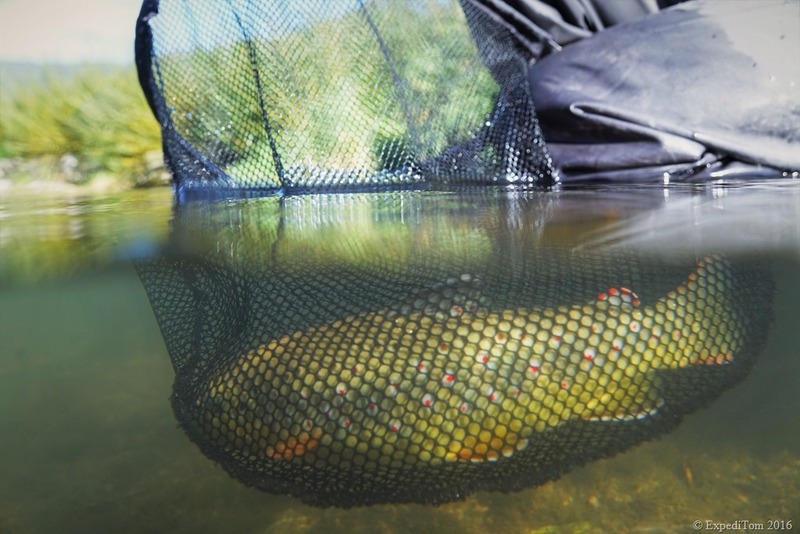 Did you undertake an end of trout season trip too? How was yours?